Light weight, weighs only 8 pounds Operator can sand 10 foot ceiling without using stilts or a scaffold Motor is located on the opposite end of the vacuum tube handle from the sanding head for best balance and control. Patented foam-backed abrasive sanding pads virtually eliminate swirl marks Articulating sand head enables operator to sand from top to bottom of a wall or ceiling without changing position. Brush type skirt surround the sanding pad aiding in dust control and preventing pad from gouging wall joint. 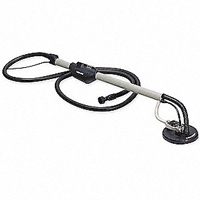 Built in dust collection connector eliminates kinking or twisting of vacuum hose. Variable speed dial adapts sanding pad speed to the application.